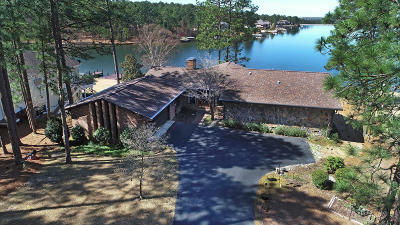 Waterfront home on prime Lake Auman lot! Enjoy great views of Lake Auman from this brick home! Spacious layout--3 bedrooms on main level plus large kitchen, dining, living room and 3-season porch. Lower level features den with bath and closet, 2nd living room and shop/storage. Big backyard with irrigation that pumps from the lake and two docks. Solar tubes in guest bath and hall, cedar closet in guest bedroom and hall. Three-season porch with tinted windows. Laundry with sink and cabinets. Working wood-burning stove, workshop and storage area on lower level. The crawl space is encapsulated. Roof approx 3 years old, HVAC approx 5 years old. Enjoy the amenities of Seven Lakes--800-acre Lake Auman, tennis, basketball, playgrounds, community center, marina and more! West End Schools!